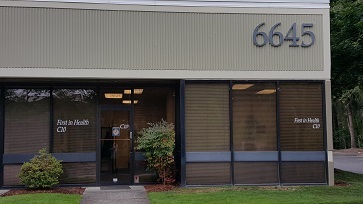 Contact First In Health, Inc.
Take exit 23B to Killingsworth westbound, head on to Columbia Blvd, turn right on 80th (Airport Business Center), left on Holman, and right on 78th Court. Or follow the signs to the Radisson Hotel, we are right behind it. Take exit 306A (Columbia Blvd) to Columbia Blvd eastbound. Turn left on 80th (Airport Business Center), left on Holman, and right on 78th Court. Or follow the signs to the Radisson Hotel, we are right behind it. Take exit 307 and follow the signs to Marine Drive East. Turn right on 33rd Ave and left on Columbia Blvd. Turn left on 80th (Airport Business Center), left on Holman, and right on 78th Court. Or follow the signs to the Radisson Hotel, we are right behind it. Plenty of on-street truck parking available on 78th Court. Bobtail parking available in front of clinic.